﻿ Time Is Running Out To Renew Your 2020 Chili Bowl Tickets! 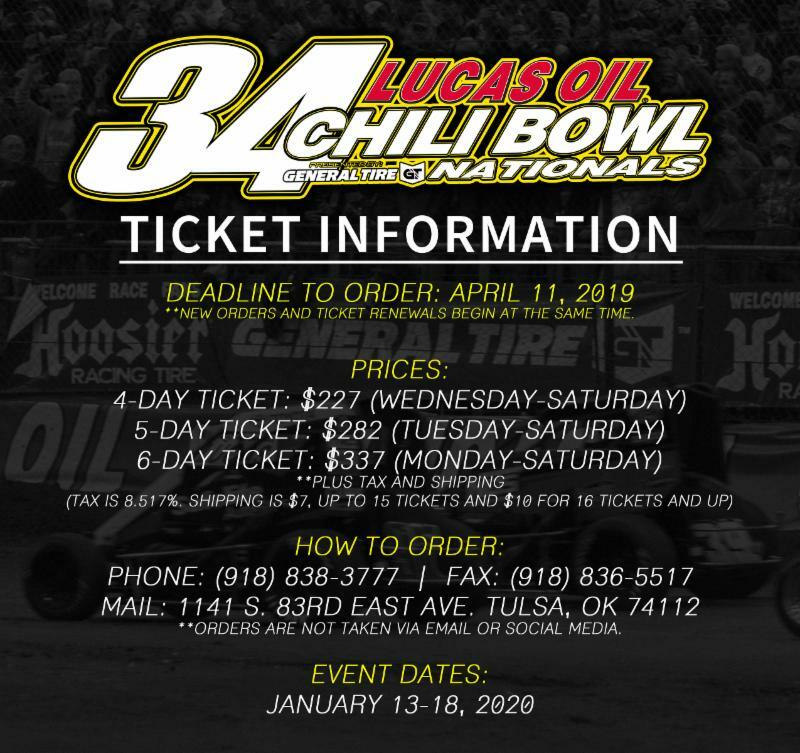 Ticket orders for the 34th annual Lucas Oil Chili Bowl Nationals presented by General Tire have begun. Here are some quick reminders. All orders, renewals and new, are being taken at the same time. You have until April 11, 2019, to renew your ticket or get on the waiting list. Tickets are sold in 4, 5, or 6-day packages. Prices for the 2020 event are as follows: 4-Day (Wednesday-Saturday) $227; 5-Day (Tuesday-Saturday) $282; 6-Day (Monday-Saturday) $337 Prices shown don't include Tax or Shipping. The Tax rate for Tulsa, Okla. is 8.517%. Shipping is $7 for orders up to 15 sets of tickets and $10 for orders of 16 ticket orders up. Domestic orders will be sent via USPS Certified Mail. You can opt for Will Call instead. All International orders are kept in Will Call. We accept Visa, MasterCard, Cash, Check, and Money Orders. Orders are taken by phone at (918) 838-3777, by Fax at (918) 836-5517, or by mail to 1140 S. 83rd East Ave. Tulsa, OK 74112. We will not accept any order over Social Media or Email. We are open Monday-Friday from 9:00 A.M. to 5:00 P.M. (CT). When we process orders, they are done by hand. We start changing for tickets during the month of May and ship out all orders in June. If you have any other questions, you can find the Ticket FAQ online at https://www.chilibowl.com/ticketinfo/ or just give us a call.